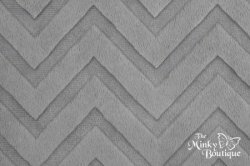 This soft cuddly fabric features an embossed Chevron design. A two-tone color is depicted by the embossed design. The fabric is dyed a solid color with a "high/low" pile. The design runs the width of the fabric, has a 5mm pile, 450 grams and is 58-60 inches wide. 100% polyester, machine washable and dryable. Made in Korea.